Arlington Christian Academy is participating in Nemours’ National Early Care and Education Learning Collaborative, a childhood obesity prevention program funded through the Centers for Disease Control and Prevention. As part of this collaborative, the program is building an outdoor classroom where children will have the opportunity to not only learn about growing food but also to increase their consumption of fruits and vegetables by eating the produce that they harvest throughout the year. Atlantic Beach Urban Farms approached Kelli Allen of Arlington Christian Academy about providing them with a vertical aeroponic tower, to which Kelli replied “absolutely!” Atlantic Beach Urban Farms, a farm with 300 indoor aeroponic towers located in Atlantic Beach, Florida, then donated a commercial tower along with seedlings to Arlington Christian Academy. 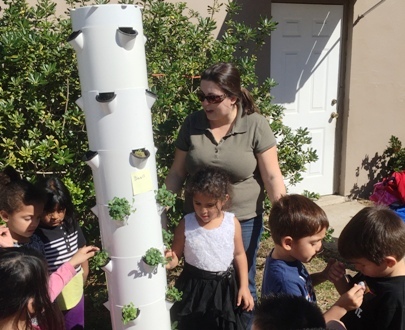 Their resident farmer helped the children install and plant the tower. She trained staff on the care of the tower and is available to them for technical assistance. The tower was planted with 28 seedlings that will be ready to harvest in two to three weeks. Marc Coeglin, director of Early Childhood Alliance-Beacon Center, wanted to build a garden to introduce children to fruits and vegetables and allow them to participate in growing them.